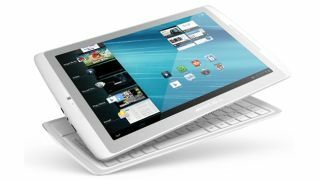 Archos has announced that arrival of its latest tablet in the 10.1 size range: the Archos 101 XS. This Android 4.0-toting device is one of the slimmest tablets around – at 8mm – and it comes complete with its very own Coverboard, a cross between a cover and a keyboard. At 5mm thick, the cover adds a little girth to the tablet but still only makes it 1mm fatter than a new iPad. Connecting to the Archos 101 XS by magnets, once you flip the cover off you can use it as a keyboard dock, which essentially puts the XS in direct competition with the Asus Transformer Prime range. When it comes to specs, there's an Arm smart multi-core A9 processor at 1.5GHz, 16GB of memory (expandable by microSD card), 1GB of RAM and the display quality is 1280 x 800. There is also a 720p camera on the front, access to Archos' media centre and a multitude of connections – including USB 2.0, mini HDMI, Bluetooth, Wi-Fi and Wi-Fi Direct. Weight-wise you are looking at just 600g and you will be pleased to read that Archos has decided not to tinker with Android whatsoever – offering the OS as Google intended. Archos has told TechRadar that the Archos 101 XS will be updated to Android 4.1 Jelly Bean come November. TechRadar has already fondled it, so check out our hands on: Archos 101 XS review for a more detailed look at the tablet, which is set to come out mid September and cost £299.